The Da Vinci Code movie is coming out tomorrow, and it's going to bring bold-faced blasphemies to the big screen in the name of "entertainment". People are suggesting all kinds of responses to the movie, but perhaps the best defense would be to get believers on their knees. In some ways the situation is akin to that of Paul, who "breathing out murderous threats against the Church" was on his way to Damascus to blaspheme the name of Christ; we all know what happened to him. 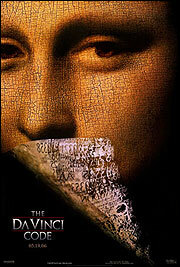 So as the masses stream to the theaters tomorrow to revel in the blasphemies of the Da Vinci Code, let's pray that many of them would see the utter ridiculousness of the claims made by the movie, and see the Great Light! My own opinion is that the book and the movie [both] belong in the dumpster rather than bookstores and movie theaters. They contain outright blasphemy of Christ by suggesting that he married here on Earth, denying his crucifixion and resurrection. This isn't something new though; this kind of attack has been going on throughout the centuries against Christ, and will continue to go on. So the real question is, how can we best prepare to defend the name of Jesus against those who would drag it through the mud? Those who would like to go to the movies to see what Dan Brown has to say are essentially saying that it is good preparation to study the enemy's attack. Personally, I don't think this is true; we would be better served to get into the Bible on our knees and ask the Lord to reveal His awesome majesty to us. Then when [we encounter these] paltry blasphemies we can show [people] at least something of the glories of Christ! but in your hearts regard Christ the Lord as holy, always being prepared to make a defense to anyone who asks you for a reason for the hope that is in you; yet do it with gentleness and respect, having a good conscience, so that, when you are slandered, those who revile your good behavior in Christ may be put to shame. I think Matt's right. May we respond by (1) testing all of our interests and motives, and (2) praying, as Matt, put it "that many of [the people who see Da Vinci] would see the utter ridiculousness of the claims made by the movie, and see the Great Light!" Go ahead and breath a prayer now.